I found this delicious (curd) soft cheese dessert recipe in one of the rustic newspapers and modified it a bit. This is an easy to make dessert and a healthy one, too. You can use low fat curd for it, if you count calories. I crushed the curd, added sugar and mixed in coconut chips. That’s it for the basic recipe. I also added some walnuts and chopped orange with juice. 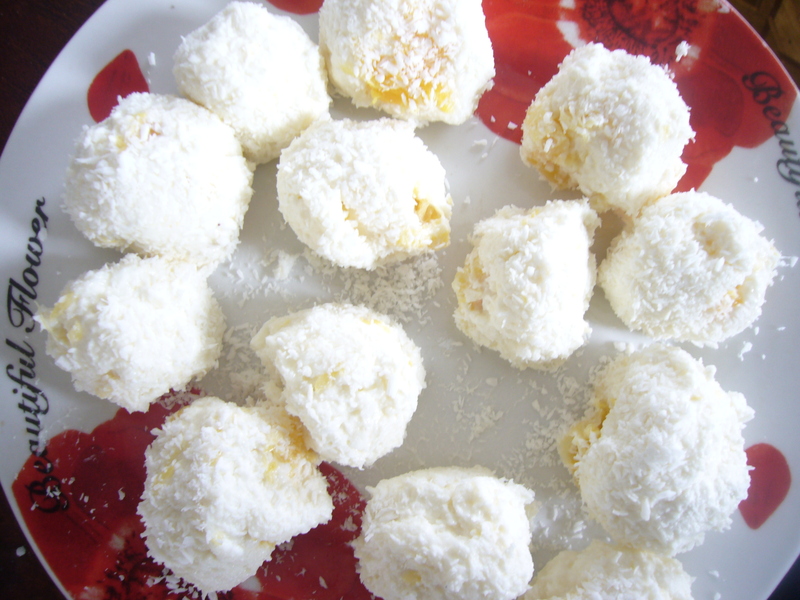 I mixed it all up, then rolled the balls and dipped them into more coconut. Done! It’s a very fast and tasty cheese desert recipe! This entry was posted in Easy Recipes and tagged busy mom, cheese, cheese desert recipe, cheese dessert recipe, coconut, cookies, cooking, cooking tips, creative tips, curd, desert recipe, design ideas, easy cooking, easy dessert, easy recipe, food, quick dessert, quick snack for kids, recipe, tips for moms. Bookmark the permalink.